It began in 1949 on Friday night on a little 1,000 watt radio station out of Marion, North Carolina on WBRM. The show itself originated from Spruce Pine, NC, a town that held then only about 3,000 folks. It was nestled up about the 3,000 foot level in the Blue Ridge Mountains. The show started off in a small auditorium that held about 600 folks; plans were in the works in 1950 to build a 1,500 seat facility to "...accommodate the people who are turned away each week." "Hello Neighbors, this is 'Cal' Calhoun sending your way the first edition of THE CAROLINA BARN DANCE!" Cal picked all the acts, most practically right out of the amateur contests he had held over several counties. His musical tastes must have been pretty good as just about all of them were hits right from the start. The show became a hit with the listening audiences and became known as "Your Favorite Homefolk Program". 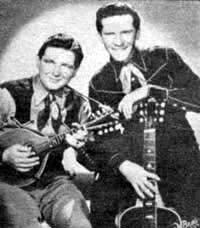 In 1950, some of the folks featured on the hour-long show included the legendary Stanley Brothers, Carter and Ralph and their Clinch Mountain Boys who were recording for Columbia at the time. Other notable acts included folks such as Clyde Miller and Betty & Buck, a father and daughter team. 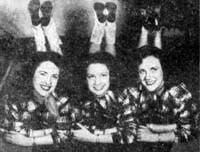 The show also had some guest star appearances from other name hillbilly entertainers who were in the area such as Bill Monroe, Claude Casey, The Briarhoppers, and Whitey and Hogan.